Preheat the oven to 190c, gas mark 5. Place 8 eggs in a large pan with enough cold water to cover them by 2cm and place over a high heat. As soon as the water starts to simmer, set a timer for 1 minute 45 seconds exactly. While the eggs are cooking, fill a bowl with cold water and ice and after the exact time has elapsed, take the eggs out of the saucepan and plunge them into the water to cool. Place the sausagemeat in a bowl and add the thyme, mustard,cayenne pepper, seasoning, chopped chives and 2 tablespoons of water. Mix thoroughly and form 8 patties with your hands (dip your hands in cold water if the mix sticks). Chill in the fridge for 20 minutes. Once the eggs are cool enough to handle, gently remove the shells. Flatten each pattie into a circle and place an egg in the centre. Wrap the sausagemeat around the egg, pressing the edges in order to seal it but being careful not to press too hard. Heat a deep fat fryer to 190c or fill a saucepan with oil deep enoughto cover the eggs and heat to 190c. Fry the Scotch eggs 2 at a time for 2 minutes until golden brown. Remove from the oil with a slotted spoon and place on a drying rack over a baking tray. When all the eggs have been fried, place the tray in the oven for an additional 10 minutes. Serve immediately while the yolks are still runny. Make a mustard mayonnaise to dip the eggs in by stirring 1 tbsp of French’s mustard into 3 tbsp of mayonnaise. 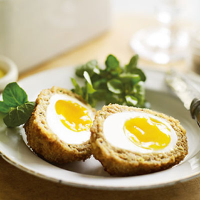 There's nothing better with a Scotch egg than a glass of cool, refreshing English ale or cider. Marston's Pedigree Classic English Ale or Aspall Dry Premier Cru Suffolk Cyder. Nutritional values per Scotch egg. All eggs should be thoroughly cooked. For the latest guidelines, visit foodstandards.gov.uk. Recipes containing semi-cooked or raw egg are not suitable for pregnant women, elderly people, or those with weak immune systems.